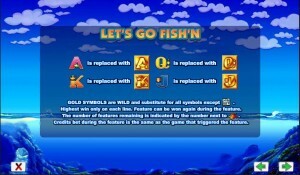 In Let’s Go Fish’n, you’re going to discover a typical fishing themed slot machine, though one where the action takes place on the ocean, and not on a quiet little river or a mountain lake. It’s one of the games which come from Aristocrat, a slot developer which has released a number of quality titles online, but they also have a huge presence in regular casinos. The game will offer 25 lines on 5 reels, a favorite layout for the guys from Aristocrat. The features are much more limited than those from other titles, offering scatter symbols and free spins which will bring with them some wilds. Top payouts of $12,500 are possible. 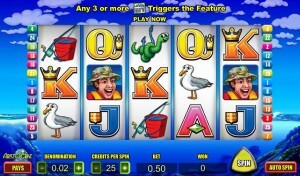 While the game will offer you the features you’re used to seeing, some of them are only available during the free spins. I’m talking here about the wild symbols, which the base game doesn’t have. 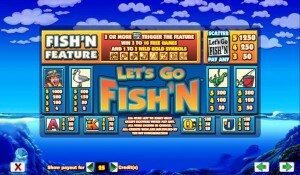 You get only scatter symbols there, which will offer rewards and free spins. The game’s title is seen in the only symbol with special powers that the base game offers. You will find a scatter in it, a symbol which has the ability to offer you its prizes by being present in enough random locations at the same time, without it being required to cover certain paylines. You will get paid quite handsomely when this happens, up to 50 times the triggering bet being offered back to you. 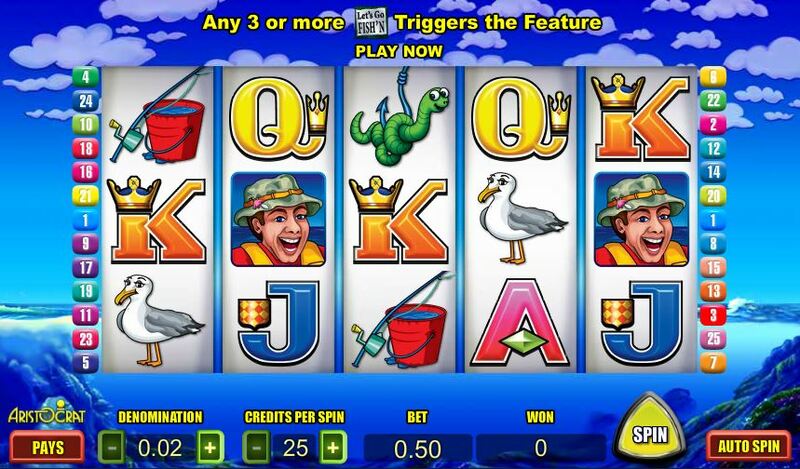 When a minimum of three Logos are scattered on the reels of the base game, you will get a reward which consists in 3 to 10 free spins and in randomly chosen wild symbols. 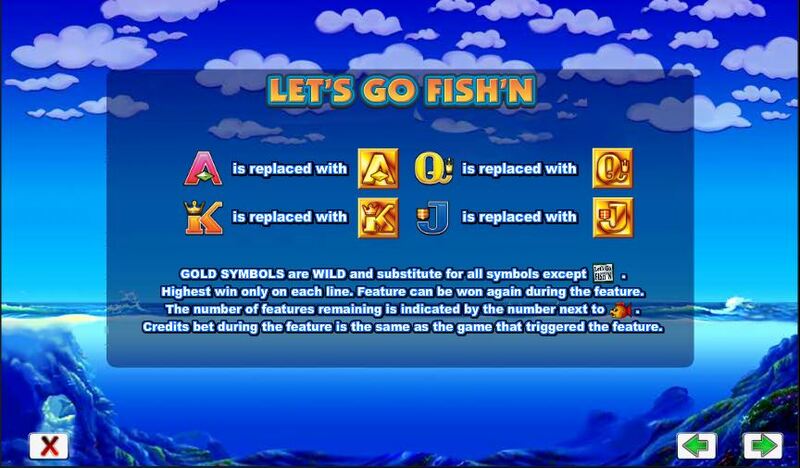 The game will choose between 1 and 3 symbols that will be turned into wilds for the duration of the free spins. 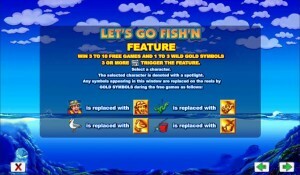 Those symbols will become golden, and they will help you get more winning combinations during the free spins. For each line that you use, you get to wager between 1 and 5 coins. These coins have denominations of up to $2, so the line bet’s range is between $0.01 and $10. Maximum bets of $250 are allowed. You will get paid up to 1,250x the line bet, that amount being offered by the scatter symbol when it’s in five locations at the same time. That’s a top jackpot of $12,500. Since the action takes place on the ocean, that’s exactly what you see in the background image. There are no fishing boats or fish there, only the ocean and the waves that are coming towards you. Interestingly enough, the bottom half of the screen shows you the underwater landscape, but again, with no fish in it. The symbols are either connected to fishing (fisherman, bait, birds and fishing tools) or they’re playing cards. Symbols: Game Logo (1,250x, scatter), Fisherman (1,000x), Bird (500x), Bait (300x), Fishing Rod (300x), Ace (150x), King (125x), Queen (100x) and Jack (100x). 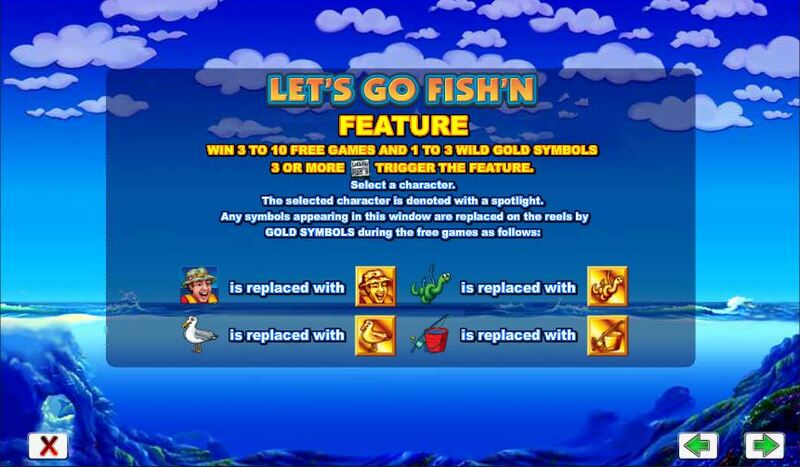 Fans of fishing will enjoy playing it, and the design isn’t too bad, but the features are somewhat of a disappointment, especially since the wilds are missing from the base game. 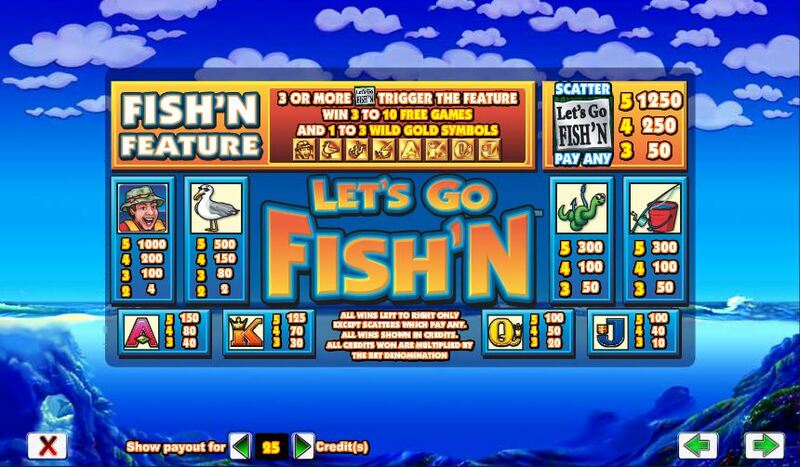 You will find Let’s Go Fish’n at any online casino which chooses to use software from Aristocrat, playable either for free or for real money.